The Balinese definitely have an affinity for massage. They are brought up with it, as they massage their children from an early age. They have many colleges now and are very well trained. I have never had a massage in Bali that wasn’t excellent. Though, to be honest, I don’t tend to favour the ones which take place on the beach in public. If you’re really short of cash, though, you can get a massage or a pedicure for as little as $5 on the beach. Personally, I prefer a little more luxury and choose to spend about $20 an hour for my massages, although in upmarket hotels you can pay almost Australian prices. Many hotels have their own massage rooms or spas. The first few times I ever went to Bali, we stayed at the Peneeda View in Sanur, where there was a little bale or thatched hut next to the swimming pool, with a lady who gave the massages for about $10 an hour. She was wonderful and we went to her for many years until she retired and her daughters took over. The last time I was there, the girls took delight in trying to teach me Indonesian while I was waiting. Massages are often done in a bale or thatched hut. 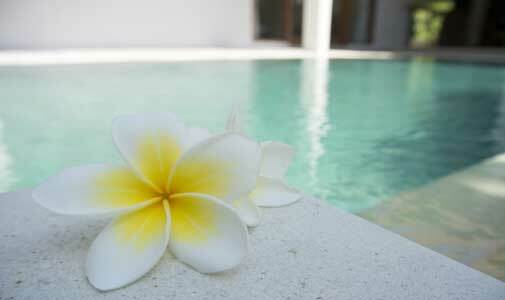 The Tjampuhan Hotel in Ubud has one of the prettiest spas in Bali. It has an underground grotto full of carvings, with hot and ice-cold pools, so you can go from one to another and then into the steam room. The massage treatments are given high up above the river on the edge of the ravine. When I went there, I had a boreh spice wrap, which contains clove, nutmeg, cinnamon and ginger. It was a rather warming feeling, but then it all gets washed off in cool, scented water in a lovely bath overlooking the jungle. 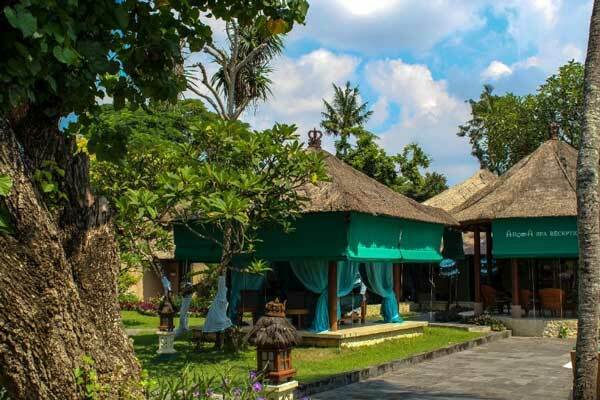 Everywhere you go in Bali, you will find salons and spas on almost every street, with a myriad of treatments of all kinds being offered—from haircuts to massage, to acupuncture, podiatry and pedicures. It’s great to be able to do all these things in the same place, often simultaneously! Usually you can go in without an appointment and they are open from early morning until late at night. I love being able to just pop in somewhere whenever I feel a bit stiff or my back aches. I usually have a massage every other day and it keeps me really healthy and flexible. I tend to go wherever is convenient and have always been really pleased, but we have developed some favourites over the years. 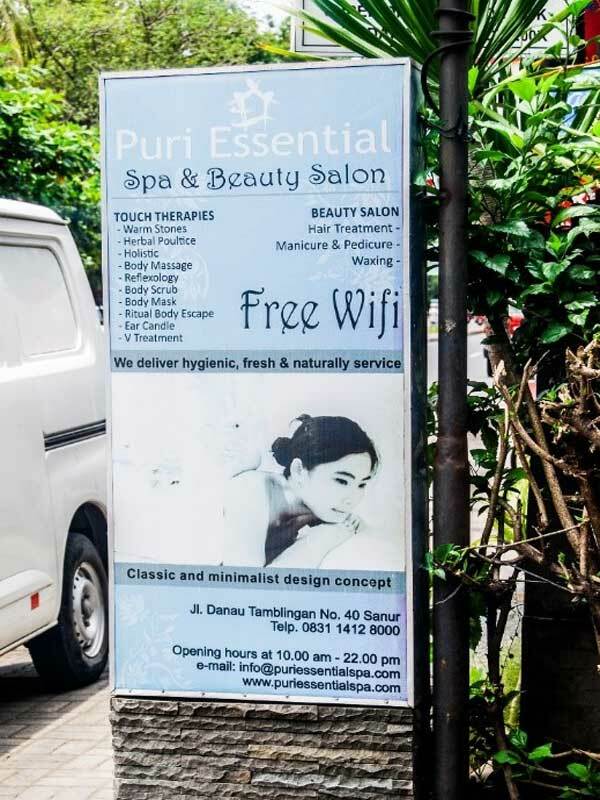 Everywhere you go in Bali, you’ll find salons and spas on almost every street. One of those is Cosmo in Sanur. It’s friendly and fun. We go in as a family. My partner, Andre, has a facial and his hair cut—and comes out looking 10 years younger. A haircut is never just a haircut, but a head-spa. You get your head, neck and arms massaged as they do your hair, which is an incredible feeling. Mum likes to have a hair wash and trim, a gentle back massage and a pedicure and I go for a really strong shiatsu massage, where they climb all over you and pummel your body into submission. There is something for everyone and we all come out feeling like a million dollars. You certainly don’t have to pay that much either. Massages, manicures and pedicures start at around $20 an hour and haircuts are $18. Some of the treatments you can get in Bali are incredible. The recipes of the concoctions they plaster on your body get more exotic by the year—from massages with essential oils to wraps or facials with coffee, marine algae or spices, to all kinds of things like body detox and blissful soothing baths with floral oils or coconut milk. You can go to a spa and spend the whole day there, getting the works on your whole body. Reading the spa menus is almost as exciting as reading the restaurant menus! One of the most traditional is the Mandi Lulur body scrub. Originally a treat for the Javanese royals in the 17th century, you are covered in the traditional Javanese lulur, which is a paste containing turmeric, sandalwood, cinnamon, ground nuts and rice, which exfoliates your skin. Then it is washed off in a lovely fragrant bath, scented with petals. Go on – treat yourself. You deserve it!